Hilltop Manor is one of the largest properties in Sylvania. The roof, walls, floor and chimney are all one solid construction with nothing but the external and internal railings and the front door lamps to be attached. This beautifully designed mansion has three floors with the childrens’ nursery on the top floor. The middle floor has a split-level master bedroom with balcony, landing and a side access master bathroom. With a large front porch, the ground floor features a split-level dining room, spiral staircase, hall and large side access kitchen. 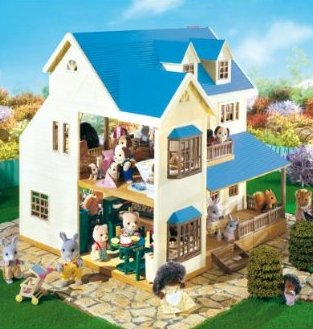 This is truly the best Sylvanian house ever. Figures & furniture shown in main image not included.